USB 3.0 A Male to A Female Extension Cable, uss to extend the length of your USB cable. 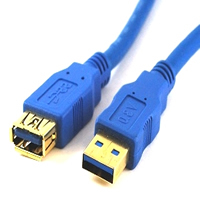 Our blue 6 foot USB 3.0 SuperSpeed extension cables offer the next great leap in data transfer speeds for your devices. 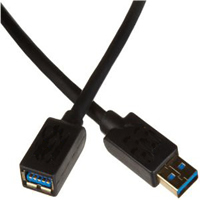 These particular USB 3.0 cables feature a Type A Male (Computer/Tablet/Laptop/Hub side) to Type A Female (Device side with Type A Male ended cable). This USB SuperSpeed cable enables the extension of an existing device up to a total of 10 feet without a hub/repeater or up to 60 feet (six cables) with hubs/repeaters. This USB extension cable will extend a standard USB 2.0 cable with a type-A connector. USB 2.0 cables are backwards compatible as they can carry a USB 1.0 and 1.1 signal. USB cables are used to connect devices such as digital cameras, digital video cameras, scanners, printers, web cams, mice, keyboards, joysticks, network connections, etc. The maximum length for a single USB cable is 15 feet. To get more than 15 feet you will need to boost the signal with a repeater Cable.